HANOI, Dec. 19 (Xinhua) -- "There was hardly any road, all you could see were pineapples, pineapples, and more pineapples. 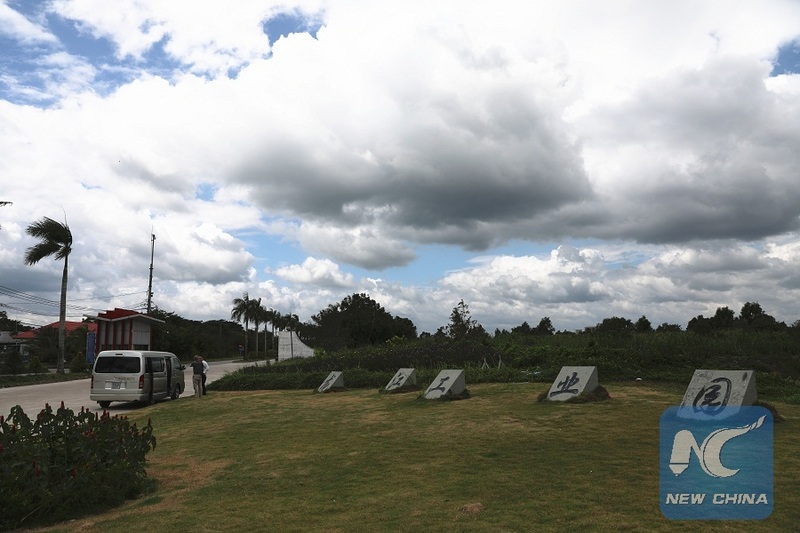 We took a car, then a motorbike, and finally walked to get there," Weng Mingzhao, board chairman of Long Jiang Industrial Park Development Company in Vietnam, recalled the time he first set foot on the park's venue 12 years ago. Twelve years later, on the former pineapple fields in Vietnam's southern province of Tien Giang, modern office buildings and factories have shown up miraculously, and container trucks full of cargo busily coming and going. The 600-hectare industrial park has become one of the largest and most advanced industrial parks built by Chinese companies in Vietnam. On the roadside, huge billboards highlighting the name of the industrial park in Vietnamese, Chinese and English show the direction for those who are interested in investing or working in the park. "The development of Long Jiang Industrial Park can be said to be a microcosm of China's pushing forward with its reform and opening up with more and more Chinese companies going global and deepening production capacity cooperation with partners around the world," said Weng. According to Weng, China and Vietnam are very close neighbors connected by mountains and rivers, and Vietnam has also adopted the "Doi moi" (Renewal) policy, making it an important destination for Chinese enterprises to follow China's "Go out" policy which encourages them to invest overseas. Following the Renewal policy, Vietnam, Tien Giang province in particular, has been in dire need of foreign direct investment. And China chose Tien Giang as a destination. Construction of the first 100-percent-Chinese-backed industrial park in Vietnam, Long Jiang Industrial Park, officially started in May, 2008. "We started from scratch. We leveled the land, paved roads, dug trenches, laid pipes, got water and electricity facilities in place, planted trees and flowers, and built office and factory buildings, as well as our own sewage treatment plant and electricity substation," Yu Suo, the industrial park's president, recalled. "At that time, the financial crisis hit the region really hard. It was very difficult for us to find qualified tenants, I mean companies with green and high technology. But we managed to stick to the standard of Long Jiang and keep those who just wanted some quick money away from the industrial park," said Yu. Long Jiang's adherence to high standards and sincerity has won the hearts of many investors from different countries and regions. "We have visited a lot of industrial parks and finally decided to set up our first overseas production base in Long Jiang," Xin Qiang, director of the Bellinturf Industrial (Vietnam) Company, said, standing in front of the firm's modern production line with a total length of nearly 1,000 meters. The firm's mother company, based in the Chinese province of Shandong, is one of the world's largest manufacturers of artificial turf as well as a FIFA-licensed manufacturer. Last year, it built a plant (the first phase) and an office building covering an area of more than 100,000 square meters in Long Jiang. The company is preparing to expand its production in Vietnam. "We have a four-phase plan here in Long Jiang, and the second phase has already kicked off," Xin revealed. "The working environment as well as salary and social benefits are good, so along with five of my relatives we are working here very comfortably," said Nguyen Thi Thu Ngan, 24, a production supervisor at Bellinturf Industrial (Vietnam) Company. Ngan is one of the countless motorbike commuters of Long Jiang, riding a motorbike 13 km from her parents' house to the industrial park every day. "After working here for about a year, I bought myself a new scooter. Now I'm continuing to save money so that I can buy a house of my own," the young woman said. Like Ngan, more and more people in Tien Giang province have found the industrial park more profitable than pineapple land. Attractive paychecks and welfare have lured a lot of local farmers to the industrial park to become skilled workers in the factories. "My daughter and my four nieces are now workers in Long Jiang. If we had been involved in agricultural work now like in the past, our life would have been hard," said Dang Thanh Tam, an elder resident of Tan Lap 1 commune, Tan Phuoc district, Tien Giang province. Like many other residents, the elderly man has recently replaced his makeshift cottage with a firm brick house. The soaring population due to the attractiveness of the industrial park also means business opportunities. More and more local residents are opening restaurants and shops around Long Jiang, while others are busily building new houses for workers from remote places to rent as their dormitories. "Thanks to the industrial park, our rural area here has undergone many positive changes," said Doan Van Nen, secretary of the party committee of Tan Lap 1 commune and chairman of the communal People's Committee. "In the past, many people here were farmers. They could not do agricultural work all the year round, and their income depended on the weather. 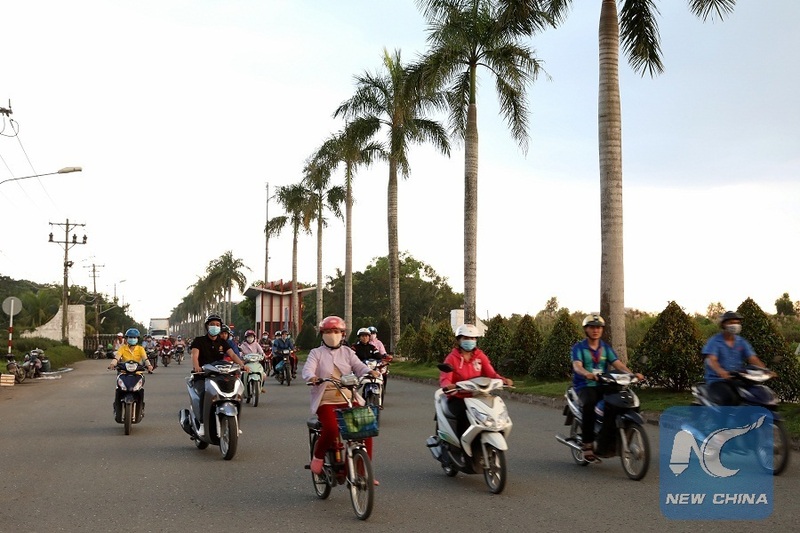 Now the industrial park has provided many of them with stable jobs and fairly good incomes," the local official said, adding that the park has also helped the commune implement social security policies effectively. "I changed from nobody to somebody now," Tran Thi Ngoc Dung, human resources manager of Long Jiang Industrial Park Development Company, summed up of her 10 years at the industrial park. In 2008, Dung, a university graduate with Chinese as her major, overlooked job opportunities in Ho Chi Minh City, Vietnam's southern economic hub and returned to her hometown in Tien Giang to work in Long Jiang Industrial Park when it was still in its infancy, and gradually became an experienced manager. "When I studied Chinese in university, there were only a few Chinese-backed companies here. My parents worried that I could not find a job. Now my husband and I have opened a language training center. Many students of mine happily told me that thanks to my good command of Chinese, they were praised by their bosses and given salary hikes," Dung recalled. To date, 45 companies, including those from China, South Korea, Japan, Singapore, Malaysia, Australia, India, Denmark and Vietnam, have invested more than 1.5 billion U.S. dollars in Long Jiang, creating some 15,000 jobs for local people. In 2017, the industrial production value of enterprises in the industrial park accounted for nearly one third of Tien Giang's total. Hanging on the wall of Long Jiang's conference room are many certificates of merit and awards given to the industrial park and its people, including Weng Mingzhao, by Vietnamese authorities over the past decade. "We would have not gained these achievements without the support of our country," Weng said. More and more Chinese enterprises go global under favorable policies and find Vietnam a promising investment destination, Weng said. "As we are celebrating the 40th anniversary of China's reform and opening up and the 32nd anniversary of Vietnam's Doi moi, we are deeply inspired to see the two countries join hands more often under China's Belt and Road Initiative and Vietnam's Two Corridors and One Economic Circle plan," said Weng. "We will seize the opportunities and make Long Jiang a more stable and convenient development platform for our tenants," he went on to say.